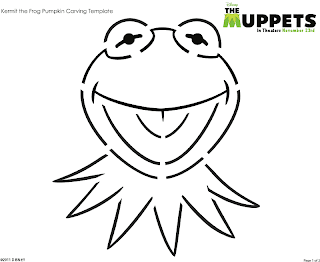 And if you still need to do some pumpkin carving, try this Kermit stencil. The design looks like it would be pretty quick to complete. If you print it out now (click the image for a printable version that includes instructions) you could be done in less than an hour I would suspect! Baby C. is a little young to appreciate a jack o’ lantern so we didn’t carve any pumpkins this year. She was very taken with pumpkins in general, though, so I was glad to find a really cute alternative while shopping at Target. They had these sets of Disney pose-able pumpkin kits where you stick the arms, legs, and face into the pumpkin itself. 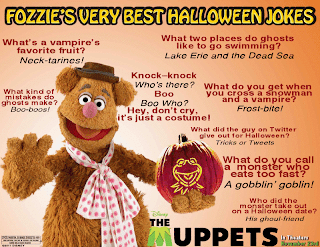 The pumpkin becomes the body and ta-dah! You have a cute Disney pumpkin for the younger set (plus no mess to clean up). 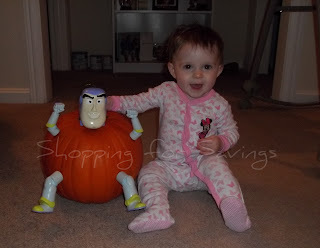 Baby C loves her Buzz Lightyear pumpkin!